Okay so I was a bit skeptical when I started hearing about using cauliflower to make pizza crust. I’ll admit, I like pizza and I really like good crust, you know the thick crunchy and chewy all at the same time kind (the kind that literally makes you thankful you’re not gluten intolerant!). But I was curious, as I usually am with any revamped recipe. 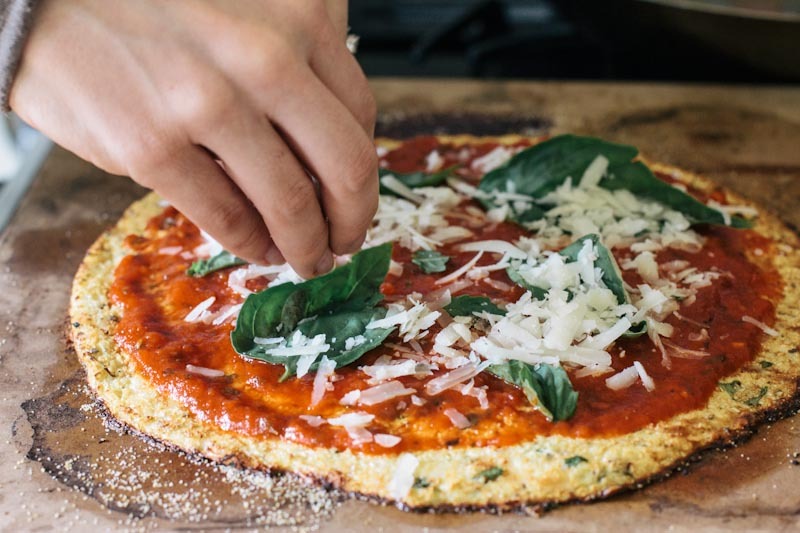 So, my friend Lindsay and I developed a cauliflower pizza crust that worked just perfectly baked on a pizza stone, resulting in a crunchy-chewy crust, not like a bread dough, but delicious nonetheless. When Lindsay came over, two cauliflower heads in hand along with a bunch of herbs, I knew we were going to have some fun in the kitchen. We planned to make two recipes, a Cauliflower Couscous Salad and then this pizza, both using cauliflower pulsed in a food processor. After a bit of testing and adding a little more of this and less of that, we settled on a recipe that both tasted good and was easy to replicate. To make the pizza, you first make the crust, cook the crust, then add whatever toppings and re-bake for a short time. We chose simple toppings: marinara sauce, cheese and fresh basil. For the cheese Lindsay brought over a manchego, which is a sheeps milk cheese that’s creamy, and distinctive in flavor but not too strong, perfect for pizza. I also learned from Lindsay that sheeps milk cheeses are easier to digest, adding to the compiling healthy benefits of this tasty pizza! The key to making this pizza crust flavorful is the added chopped herbs and cheese within the crust. A healthy dose of salt also helps improve flavor. And truthfully, as one who loves gluten-full pizza crust, I enjoyed every bite of this. And Josh enjoyed it too, though perplexed when I asked him what he thought was in the crust… he really had no idea but just knew he liked it! Give it a shot, and let me know what you think! 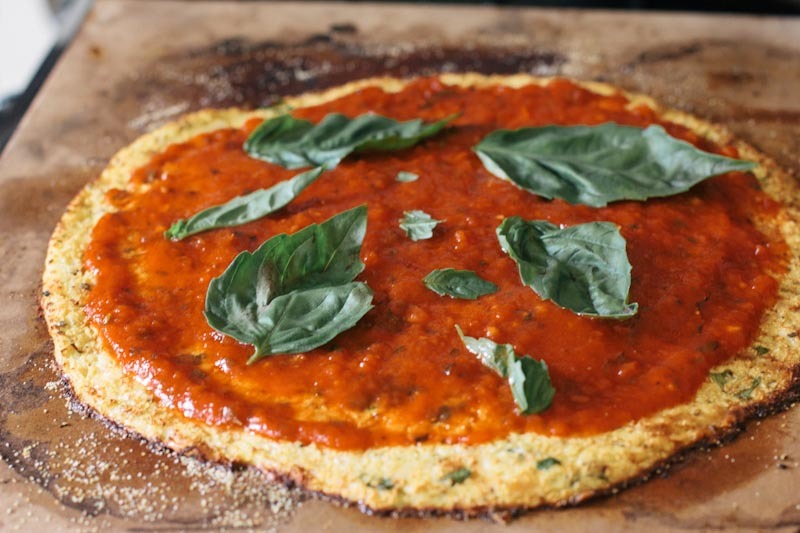 Use cauliflower for this vegetarian and gluten free pizza crust recipe. Chop cauliflower florets into chunks. Pulse the cauliflower in a food processor until it resembles a fine grain, like rice or couscous. Pour cauliflower into a large bowl. Add herbs, and salt, then cheese and eggs. Spread a tablespoon or so of cornmeal all over a pizza stone. 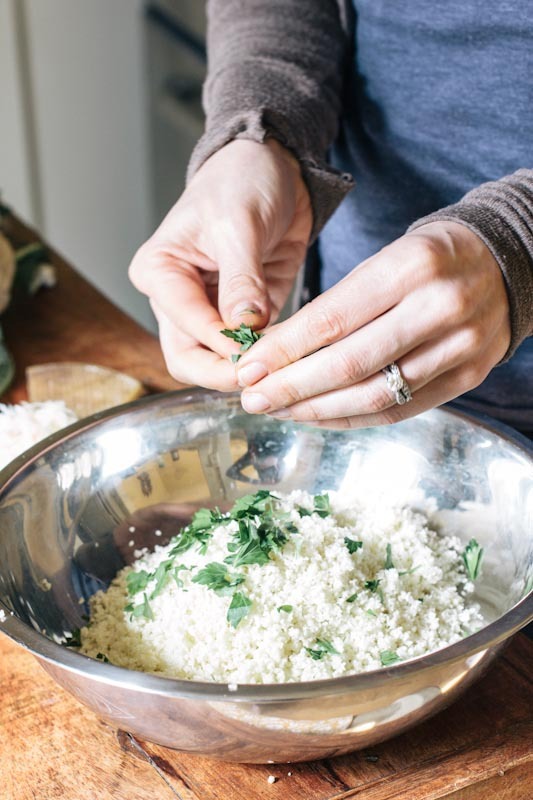 Place the cauliflower mixture (note- this won't resemble a ball of dough) on the middle of the stone and use your hands to press it into a circle about 1/4 inch thick. Bake for 20 minutes at 350 then an additional 10 minutes at 400 degrees. Crust will be done when it turns golden brown in color. Remove crust from oven. Change oven temperature to 450 degrees. Add pizza sauce, cheese and whatever toppings you would like, then bake again for about 5 minutes or until cheese on top is melted. 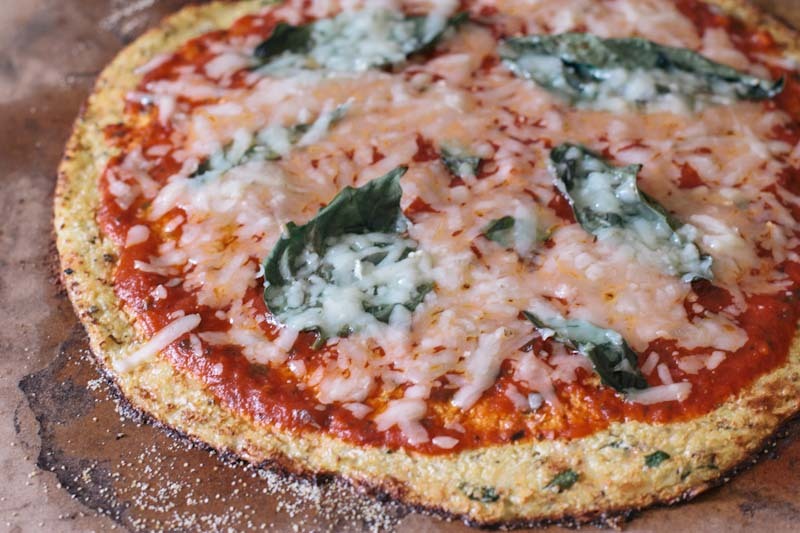 I’ve done a cauliflower pizza crust before and loved the flavor, but it never yielded the right texture. I’m totally pinning this one and trying it next week! Heather, let me know what you think and if the texture is any different than the others. I’ve also seen some recipes that add in some almond flour to make it more dough-like. YUM! Can’t wait to try! I’m so intrigued. Definitely going to try it soon and let you know! I have a couple questions… This doesn’t stick to the pizza stone? I’ve done a cauliflower crust before but used parchment on a baking sheet. I would love to use the stone, not to mention using manchego instead. Which brings me to my 2nd question; how finely did you grate the manchego? Thanks. I’m looking forward to trying this. We grated the manchego on a large grater. The cornmeal on the stone helps the pizza not to stick but it will stick a little. Make sure to use a good spatula when your peeling the slices off the stone. You could also bake it on parchment to completely prevent sticking. Hope that helps! I have been wanting to try cauliflower pizza crust for some time. I did a Google search and yours was the second on the list. We tried it tonight and loved it. This is so easy to make. I prefer this type of crust now to make at home. It’s easier than fighting with traditional dough. Thank you for posting this. wonderful to hear!! Hope you’ll come back and visit the blog for more recipes! Tasty but not pizza. I had to bake it much longer. I used a preheated stone with parchment paper. Probably 30 minutes at 350. 20 at 400 and 7 at 450. Came out beautifully golden. I would make it again and try to press it thinner. Thanks for sharing. Cindy, thanks for letting me know! So – you don’t pre-cook the cauliflower? I have seen other recipes where you precook the cauliflower before adding the eggs & chees? I don’t pre-cook the cauliflower at all and it still works. I think it’s an unnecessary step! I just made this for lunch and it was SOOOOOO SOOOO good! I used daiya non-dairy cheese which worked out great. Thank you for the post! I’ll definitely be trying more of your recipes. Vanessa, So glad you enjoyed it!! I tried this tonight but be careful of the crust and how thickly you make it. I thought mine was right and I cooked it for as long as the recipe says but it turned out extremely mushy and not crust like at all 🙁 I’m goin to try again though! Taste was OK but definitely not dough or pizza-like. Thanks so much for your comment and feedback. You may just need to bake it longer so that it doesn’t fall apart. We have used this recipe several times and it has worked well for us. I agree that it doesn’t taste like pizza dough (I think I mentioned that in the post) but we think it has a whole new tasty flavor that is very enjoyable! Terrific pizza. I made it vegan by replacing eggs with egg substitute and the cheese with soy cheese. Worked amazing. Improve crust to hold together using a bit of ground oatmeal. Amazing! Thank you!!!! Great tip on the Oatmeal Martha – thanks!! I just took my first bites and this is AWESOME! I don’t have a pizza stone, so I had to use a cookie sheet. I buttered it before putting the “dough” on (no corn meal, either) and it did not stick at all. Thanks so much for posting this recipe! PS – My husband just asked for seconds and he (strongly) dislikes cauliflower. I tried this and have no cooking skills at all. I wanted a pizza that I could make with low calories and high protein content (canned tuna as a topping for protein). I used two egg whites with 20 grams of cheese and it came out OK. I am going to try it again next week with three egg whites (more protein) and add some oatmeal as suggested above. I am going to try and dry cauliflower a bit after getting it out of the food processor so it does not take so long to cook. I tried this recipe last night and omitted the cheese and corn meal and added a quality olive oil and minced garlic to the “dough”. The flavor was delicious and spot on and I did not mind the non-pizza crust texture. In fact, my boyfriend was pleasantly pleased with my ingenuity. My cheese less pizza baked beautifully and tasted amazing. I will definitely try this recipe again and play with different combinations. I liked the previous suggestion of adding almond flour to the mix. Well, today is the second time I have made this wonderful crust. I think the lady who said it fell apart may have had too much cauliflower, and could have added another egg to help it bind. I’ve also learned to add an extra 10 min. on baking time, it could be our elevation (sea level). I also add a sprinkle of almond meal or almond ground, to add a bit of a crunch. We all love it and it has helped so much in our paleo lifestyle. Thank You so much, its truly the best so far. Once I stuck it in the processor my cauliflower is pretty watery. Your picture looks very dry. What’s the secret? I did use fresh and not frozen. Once I flattened it out I dabbed it with a papertowel to obsorb. It’s cooking now so hopefully it won’t be too soggy. Turned out great, put feta in with the crust. Then summer sausage, green peppers, onions, mushrooms, pasta sauce, and lots of cheese. sprinkled oregano on top and followed baking instructions. 18 month old and myself ate 3/4 for supper. will definitely make again. thanks for the feedback! I’m so glad you enjoyed it and it sounds delicious the way you made it! My husband made this for me for a birthday dish and it turned out amazing. Having said that, you definitely need to be a recipe follower (and the proper kitchen ware) to make it turn out how it’s supposed to. I tend to fly by the seat of my pants in the kitchen whereas he needs an exact recipe to follow — which he did, and it turned out perfectly. Upside, he wants it again and I lost 2 pounds the next morning! That would never happen with pizza crust! Thank You!! That’s just fabulous!! Glad to hear that you enjoyed it! 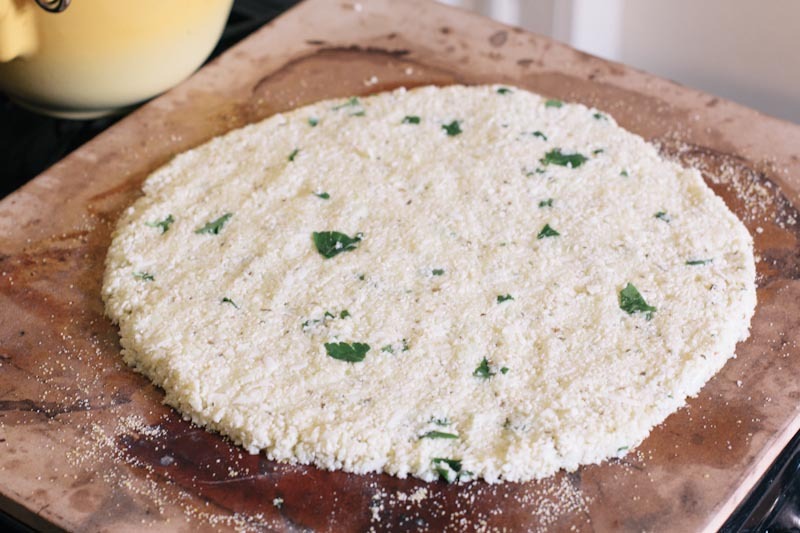 I have made the cauliflower crust from a similar recipe and it was a huge success, almost identical to your recipe, but included a 4-minute microwaving step after which you squeeze every last possible drop of moisture from the CF before adding the herbs, cheese and egg. I think this step, while may not be necessary, is important to the flavor and texture (lightness) of the crust. Good to know I can avoid the cooking step if I want to (I don’t mind the flavor of cauliflower), but I think it is necessary if I want to get as much of the water out of the cauliflower as I can. Also, I don’t have a food processor, and grating the cauliflower on a box grater worked…great…(but wish I had a FP!) I want to try a breakfast “pizza” next with some hollandaise for the sauce. Cauliflower for breakfast is just too funny! Leslie, I would love to hear how the breakfast pizza turns out!! Sounds delicious! My son and I tried this recipe. It was awful. Taste was OK, except upon baking a head of cauliflower the house smelled stinky. And EVERYTHING stuck to the pan as well as the pizza stone (we tried both). The crust never got crunchy, and overall I would never do this recipe again. Thanks for letting me know Karen. If you’re not a fan of cauliflower you definitely would not like this – that could be the problem. I am so sorry that you didn’t enjoy it but I hope you’ll give some of my other recipes a try. happy eating! I do this usually by first cooking the cauliflower in the microwave for sometime..Isn’t that required? Richa, It’s actually not required. It will get some of the liquid out but I skip that and it turns out fine. I tried this last time and the taste was amazing. I did have trouble with the crust sticking to the stone, which made it even less crispy, so it was more like a lasagna. I think next time I will precook the CF and oil the stone. The taste is too good, and I came too close to a nice crust, to not try this again. Thanks. Thanks so much for the feedback Bill!! I will try those trick next time as well. I omitted the parsley but added onion powder and black pepper. I tasted, adjusting the seasonings, until I wanted to eat the bowl of CF right there (I should add that I’m a huge fan of raw CF). I’m allergic to eggs, so I mixed in ground chia seeds then added water until the mixture started to bind a little. I followed your cooking instructions, reducing the times a little since I have a gas stove and it tends to cook a little faster. To get it brown and crispy, I left it under the broiler for about a minute. The mozzarella helped with the binding and the browning, but it never got as solid as I’m sure it would have with an egg. It didn’t completely crumple, though, and was quite chewy. I was able to slice and serve it into neat wedges. I think that if you put too much tomato sauce, that could cause the whole thing to fall apart. Next time I make this, I will put a layer of cheese, sauce and toppings, and then more cheese. Rae, thanks SO much for reporting back!! All of your tips sounds fabulous. Glad the recipe was enjoyed! Thanks for the great recipe. The whole family enjoyed the pizzas tonight, even the teenagers! When I cook on my pizza stone I either cover it in baking paper or a re-useable non-stick bbq hotplate sheet. I used the bbq sheet and it didn’t stick. No corn starch required or oil required. Keeps it nice and healthy. I’ll definitely be making it again. So glad you and your family enjoyed this Lesley! Hope you’ll return for more recipes! Are you using fresh herbs or dried? Can I use dried? I use fresh but you can use dried this time of year. Just cut the amount you use in half or even a third since dried herbs are more potent. was super excited to see this recipe and am looking forward to trying it out. That said, I have a question: how much chopped cauliflower do you yield from a small head of cauliflower? The reason I ask is that a “small head of cauliflower” is rather subjective, so I want to make sure that I start with the right amount… Thanks! Sarah, that’s a great question. It should be 3-4 cups. You should be okay unless you grab a magnificent head of cauliflower! Enjoy! I’ve been wondering about this with a husband who has been diagnosed gluten intolerant…tried it and YUM! Great recipe thanks! You can sprinkle the crust with a little parmesan cheese to give it more of a pizza crunch. This will up the calories a bit though. I’m sure that topping with slices of fresh tomatoes would also be wonderful. As french bread slices broiled with sharp cheese and tomato slices is simply delicious. You could also brush the edge with oil and season with pizza seasonings or s & p. Parmesan sounds like a great addition to the crust too. Though, you’ll see that my crust recipe actually has cheese in it 🙂 Enjoy! Yes, please report back and let me know what you think! Jane, I wish I could give you more info but I haven’t tried it. It gets pretty wet once its pulsed in the processor so I’m guessing that it would work best if you packed it tight in a freezer safe ziplock or even vacuum packed bag. If you try it please report back and I’ll do the same. 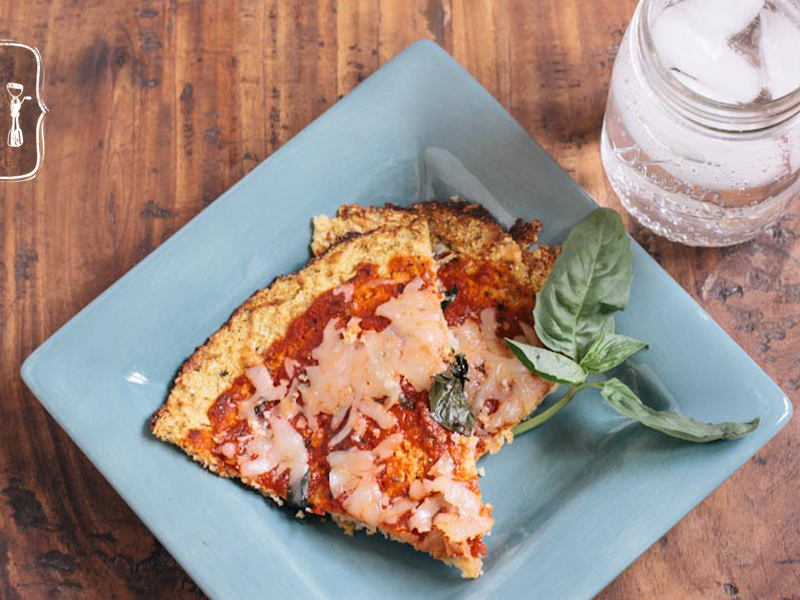 I have made this so many times & it is my go to recipe for cauliflower pizza! I always have enough for 2 pizzas & now I cook 2 at a time using parchment on my stone & also on a round pizza pan, rotating after 10 minutes. I have left the cauliflower mixture in the fridge to use later in the week but frankly cooking 2 at once is the key! We make a pesto tomato & red sauce mushroom. We also put parm on the crust before the sauce, always use manchego in the crust & thin slices of fresh mozzarella on top. When the recipe is easy enough after work & actually works, it’s a keeper! YES!! I’m so glad to hear this. Thanks so much for reporting back. Next time I made it I will be using your tips! I can’t believe I didn’t think to use parchment. Scraping yummy chunks off a baking sheet that I will have to soak for quite a while. But i’m going back in! I’ve made one before with success and can’t remember whether I used oil or parchment, but the cornmeal wasn’t enough to stop it from sticking. How would you do this with frozen riced cauliflower? I have several bags of the Trader Joe’s in my freezer. Good question. I haven’t used that before but you may need to cook it a bit or microwave it then try and get most of the liquid out before proceeding with the recipe.